Centrally located, beachfront condo on South Padre Island. This unit is equipped a full kitchen, large living area, HDTVs and bathrooms in every room, and balconies with beach and pool view. Rental includes access to a swimming pool, and private beach access. Our rental in located near all of the best dining and entertainment on South Padre Island. There are very spacious condos with luxurious natural stone finishes and accents. All rooms have a bathroom with a booth shower. 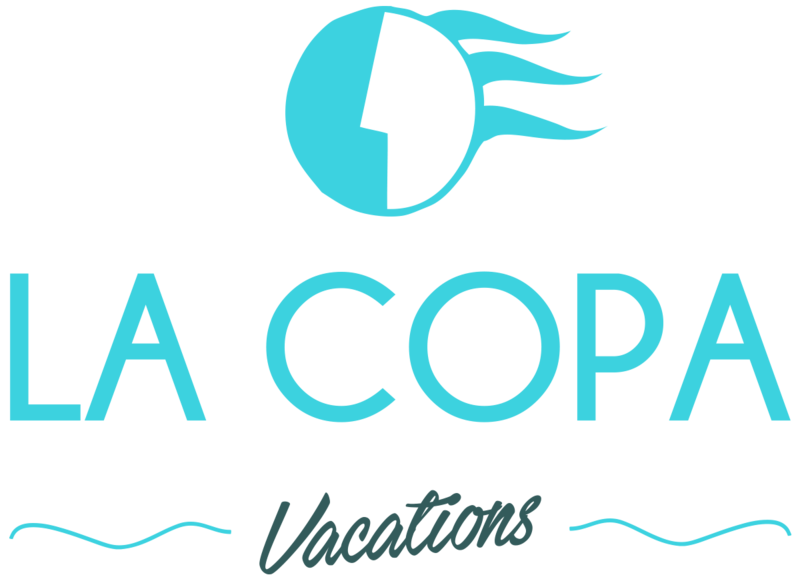 Secure access with key cards issued only with valid ID by La Copa Inn Beach Hotel. Each unit has a unique lock with deadbolt. Maintenance, management, and service staff are available on call, 24/7. This condo is centrally located on South Padre Island close to all of the best dining and entertainment SPI has to offer! The South Padre Island Metro is a free bus service that gets you within steps of most areas on South Padre Island. The island also has a "Park and Ride" facility on the South of town. Gulf Blvd., where these condos are located, is also very bike friendly. Please note that parking is limit to two vehicles per unit in the condo driveway. Each unit's parking space will be denoted. You must display your parking permit prominently inside your vehicle (preferably on the inside mirror or dashboard). These permits are available at check-in. The place was stunning and spacious. The pictures were extremely accurate. Perfect vacation for a family!! This condo was amazing! My family absolutely loved it. This beachfront property had everything you could possibly need. The interior is very luxurious and spacious. Two of my kids preferred to stay inside most of the time we were there because it was so nice. I was impressed with everything. The lighting, the air conditioning, the appliances, the DirecTV channels, the fully stocked kitchen ware, and even the shampoos were very nice. The place was very clean and the furniture was beautiful. I highly recommend this place to anyone looking. This place was perfect for our family vacation and was very relaxing. If we should come back to South Padre Island, this is where we will be staying again. Beautiful condo at a premium location with everything you need for a great stay. We thoroughly enjoyed our stay. The apartment is great and very spacious. The beds were very comfortable, it was somewhat of a challenge to regulate the temperature in the apartment but nothing too serious. Everything seem to qork fine, a team of cleaning people comes everyday and in no time they finish all the tidyying up. Great experience in general!! My only feedback would be that at check in you need to give each renter a layout of the parking lot and specify where they are allowed to park. Every single day someone parked on our space. I really enjoyed my stay here and it was a great Birthday get away with friends. Upon arrival Maintenon workers were busy keeping both the inside and outside property maintained. The pictures have the condo no justice because it was a lot bigger than it showed. The beach was basically outside my door and made the feel of the condo even more luxurious. I am definitely going to stay here again and have already begun telling my friends and family. This was my first time using this app and it was well worth it. Great place to vacation. The house was clean, quiet, and cozy. Team Copa customer service was number one. This will be our new "go to" place for SPI!!! Quick and courteous host. The condo was spectacular...clean, spacious, and beautifully decorated. Beach access and a pool were icing on the cake for our visit. Would stay here again in a heartbeat. My extended family stayed in this condo for two weeks. It's just as beautiful as it looks in the photos - spacious, clean, and quiet. The view to the ocean is breathtaking, and the courtyard pool was wonderful. We shared the pool with another renter and family and there was plenty of room for all of us. The walk down to the beach was great and the beach in front of the condo was generally not crowded. The beds are comfortable and having a bathroom for each bedroom was really great. The kitchen lacked a few utensils for baking and cooking but we got what we needed. The TVs are gorgeous. We had an issue with the living room TV the first night but it was fixed quickly. Another plus was the free hot breakfast at the hotel La Copa Inn that owns? manages? this property - it's a short drive away and the breakfast was made to order and delicious. All in all a wonderful stay and we would highly recommend it! Great place to stay! Everything was better than I expected and I enjoyed everything about my visit there! Definitely not the last time I'll be staying with Team La Copa. I will keep taking advantage of their great condos at reasonable prices. They go out of their way to make sure everything is right so that you can enjoy your vacation. Go straight through the hotel to book, great service. Most cumbersome check in process I have used to date. We took the detailed directions to unit, only to realize we drove past the separate location that we needed to check into. (Hidden by Airbnb) maps had problems guiding me to the second location and if anything it would have been nice to have written instruction to get to the check out location. I went to check in and it seems they were not sure if the unit was still available for me and just left the front desk for 20 minutes to check on it. They got it all sorted out and let me know the unit was ready and gave me my key cards. Once we got there, the unit was great. Bigger than we expected and not too crowded when we were there. The beach access was nice and our part of the beach was nearly empty during the week. The unit next door had some construction during the day, but the unit was well insulated and it did not bother us. Maybe bring an extension cord as we found no way to plug any any items near the living room TV. The La Copa Condo was phenomenal! We had not taken a vacation in years and we're so blessed to have found this place on AIRBNB. We also never used AirBNB either, but it was very easy, affordable and very informative. The condo itself looks nice from the outside, but the magic is in how they finished off the interior. There's granite countertops, stainless steel appliances, high end leather furniture with ample seating, plush beds, large windows, a lot of utensils for cooking, large screen flat-screen TVs in every room, beautifully finished bathrooms, nice flooring...this place most definitely exceeded our expectations! We spent a lot of time in the private pool which was great when the beach was too windy. There's a private outdoor shower to remove sand when you've been at the beach, a nice peer to walk you to the beach (we actually had professional pictures taken on the peer it was so nice) and BBQ pits outside (we grilled burgers and hot dogs). We had an absolute blast and I would definitely recommend this condo to our friends and family looking for a great extended stay in South Padre! Wonderful location. The ocean is your backyard. Apartments are very well equipped. There is a local HEB supermarket and Walmart about five miles away to buy groceries and make all meals at the apartment. Enjoy ocean or time in the pool. Very spacious and far bigger than I expected. The house is gorgeous! The location is perfect, right on the beach w very easy direct access. I would definitely stay there again. We shared this condo with friends on vacation and we loved it! The place was much nicer then the photos depicted. We loved how modern the furniture and decor was and enjoyed the easy access to the pool and the beach! We can't wait to stay here again. We highly recommend this place. Great home but set up was more like a hotel instead of home. On the same note, we did have cleaning service each day of our stay which was a plus! The condo is nice and modern, with plenty of room. The vehicle parking is private and easy to get in and out We stayed on the first level which gave easy access to the pool and their private walkway to the beach! We will definitely come back for another family vacation!!! Really nice location and super easy access to a nice section of beach. Even more space than expected, and even high-end touches in elements like flooring, bedding, bathrooms, etc than anticipated. However, MUCH darker in the main living area and master bedroom than one would expect for a beachfront property due to full, and dark, UV blocking filters on windows and light-blocking curtains set up to only expose 1/3 of sliding glass doors that provide view to beach. No way to even tie the curtains back or see actual unfiltered light (like you're looking through dark sunglasses) unless you open the door and just keep the screen pulled (which feels wasteful of A/C and electricity). Also, significant issue with footsteps and noise from residents in condo above. You hear what sounds like constant running when they're just moving around - and in our case that woke all of us up on a number of occasions. Finally, beach view is there, but not exactly in plain view, as you're still looking past patio, pool, and thick railing of shared patio, which often will have other residents only about 10 feet from your back door talking, swimming, hanging out, etc. Overall, a pleasant general experience and location, but not one I can fully recommend given some of the issues above and the cost. Also know that you won't even deal directly with hosts as check-in is at a local hotel a few miles away. Not much like other AirBnB experiences where I felt a connection with property owners, but the people I interacted with were friendly and courteous. I loved the house very much. extremely spacious for our family! I loved it so much i plan to stay there again this summer. The only problem was the pet hair that was all over. Im guessing the past guest had a white dog that shed a lot. My son has pet hair allergies so that was problematic. other than that the place was wonderful! Fantastic place to stay. The condo was much bigger than I thought it would be. We brought along are own beach towels and there is a washer and dryer to keep them clean. The views from the ground floor are fantastic and the beach is just steps away. Great place! loved the location. We would stay there again! Fantastic location with private access to the beach. The condo is spacious and finishes are nice. As others have mentioned foot steps can be heard from units above so that can be a little noisy. Shampoo, conditioner, and body lotion provided but we did find it odd that no hand soap or body wash was provided. Check in process was a little different, you have to travel to a separate location to pickup hotel style card keys to gain access to the condos. I was told during check in to call a property manager when we wanted to check out and I was never able to get into contact with one, I did leave a message and get into contact with the main La Copa Vacations line. Overall a pretty great stay! This place was great. It was huge. It was very well kept and a great location on the beach. Nicest condo we have ever stayed at. This is the only place we will stay at in SPI ever again. This place is super spacious and convenient. You can comfortably fit a whole family in here. Great place! Love this place and we will be back! Loved backing onto the beach and the huge outdoor patio overlooking the beach; loved the modern kitchen; loved the huge indoor flat-screen TV's; loved being minutes away from our fishing guide's marina and all the good restaurants; loved the easy check-in and check-out. Also, the pool was spotlessly clean with lots of seating a several gas grills. We thoroughly enjoyed our stay!!! Great place - lots of space, modern, clean, right on the beach. Hard to beat! Excellent location, with daily housekeeping, an added plus. We were in the ground floor unit, which we requested. Due to the layout of the building (car port on the bay side of the unit) this unit only gets light from the gulf side and can seem a little dark. I suspect that the upper floors, with balconies on both sides, would seem brighter. Extremely spacious unit and a good value in my opinion. Would rent it again on a future trip to the Island. Team La Copa did a great job of hosting a group I took to South Padre for a few days. The condo was in excellent condition and just as amazing, if not better, as the photos. Easily recommend this location to anyone desiring a stay in that area.